Juries of randomly-selected citizens to ascertain the actual privacy of ICT services?! After years of skimming through the book, I finally got to the last chapter of by James Brin’s famous book “The Transparent Society – Will technology force us to choose between privacy and freedom?”. 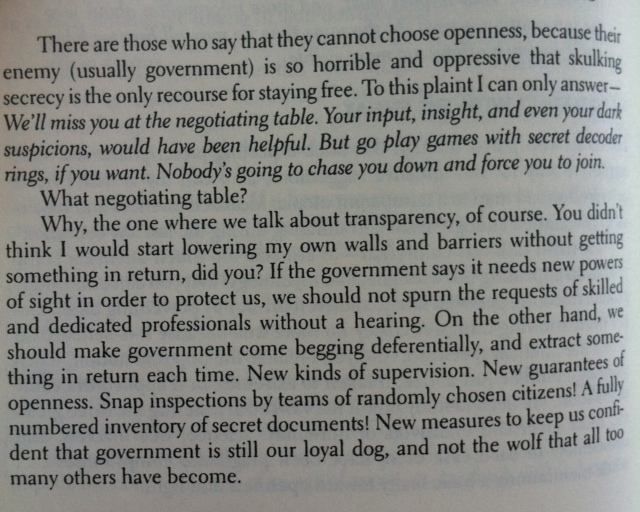 I interestingly discovered that at page 332 of 335, he hints to the potential role of groups of randomly selected citizens (or juries) to ensure the transparency of IT management of those in power, public or private (see below), as a means to ensure that the actual reciprocal transparency between citizens and big powers actually matches the one stated by laws or by Terms of Service. ADDED on Aug 28th 2013: Oversight of such randomly-selected citizens could be made more informad through processes such as deliberative polling methods, as we’d just added to our User Verified Social Telematics project.